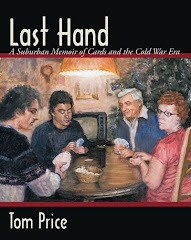 The video trailer provides a glimpse into the world of my book, Last Hand: A Suburban Memoir of Cards and the Cold War Era. The embedded video is the first view of the video trailer I will be spreading around the internet. I will also post a youtube version with reviews. I you enjoy the clip feel free to help spread the word.